HomeDBBIA EventThe Downtown Brampton Easter Egg Hunt Extravaganza is back! The Downtown Brampton Easter Egg Hunt Extravaganza is back! Brampton, Mar. 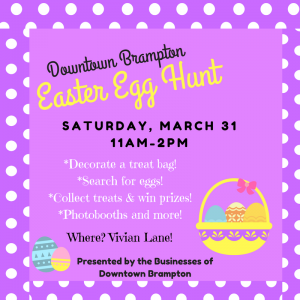 27, 2018 – The Downtown Brampton Business Improvement Area (BIA) is pleased to present the second annual Downtown Brampton Easter Egg Hunt. This highly anticipated free event is back for a day filled with family fun supported by the local business community. The Downtown Brampton Easter Egg Hunt is a free event that begins in Vivian lane (70 Main Street North) with a treat bag decorating station run by the Brampton Rangers and the Downtown Brampton BIA. Families are invited to decorate a treat bag, and collect a map with all the participating business locations listed. For each location visited, the Easter egg sticker must be spotted out to receive your treat. PhotoboothTO will also be on site to provide families with a fun memory to take home from the event! The Downtown Brampton Easter Egg Hunt runs from 11 a.m. to 2 p.m.
A special thank you to our sponsor Gage Park Towns, Kaleido Developments for supporting our treat bag station.